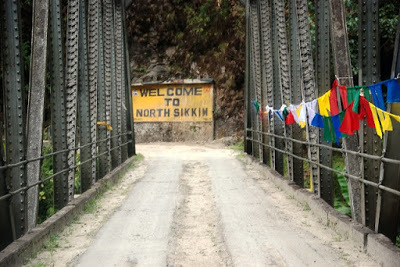 North Sikkim is the best part of the entire state. India boasts a multitude of adventure tourism destinations across its length and breadth. One of many such adventure activities in India is Bike Riding. This short blog post is especially for all biking enthusiasts planning to go on adventurous rides on off-road and challenging terrains. Below is an account of what was an unforgettable experience that changed the way I perceived the task of riding a bike through exigent terrains. What in the world am I talking about?! Sub-zero temperatures. A broken down motorcycle. A 19-year-old solo traveler amidst the mountains. Physically at his Limit. Frozen feet. Deteriorating condition. Not a soul in sight. That's what I am talking about. A treacherous ordeal that I will never forget which taught me something invaluable. Being a risk taker, I always consider all the possible outcomes (well, almost all) before heading off on a bike ride or even a backpacking trip. This ensures that I’m ready to accept any and all difficulties that might arise and face unfavorable situations no matter what. 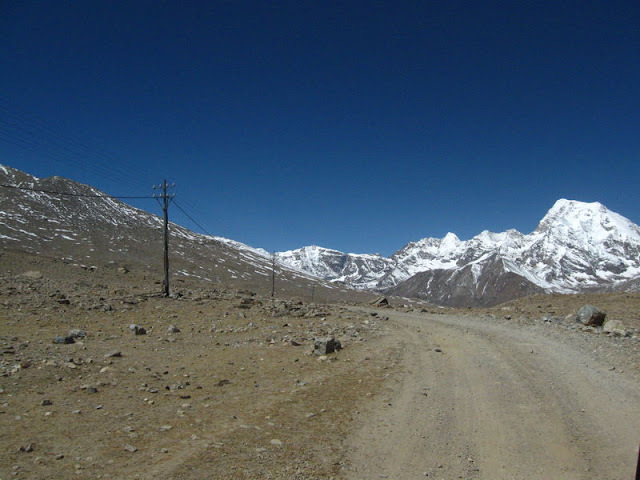 This routine probably saved my life when I got in deep trouble on my solo bike trip up to Gurudongmar Lake in the Lesser Himalayas of North Sikkim, India. Where the heck is the road? Overexposure to cold water - How bad can it be? Overexposure to extremely cold waters can lead to the manifestation of a dangerous health condition known as Hypothermia; most people have heard of it. For those who haven't, it is a condition of having an abnormally and dangerously low body temperature. A piece of advice to all the riders- while riding in freezing temperatures, where you are bound to encounter snow, black ice and puddles of ice-cold water, Never! I repeat, Never! let your feet get wet at any cost. Wear plastic/polythene bags as socks if you will, but don't make the mistake I made. Freshly melted freezing cold water is extremely dangerous and many times, Fatal! This table below represents the various levels of Hypothermia. Well, a man speaks from his experiences. 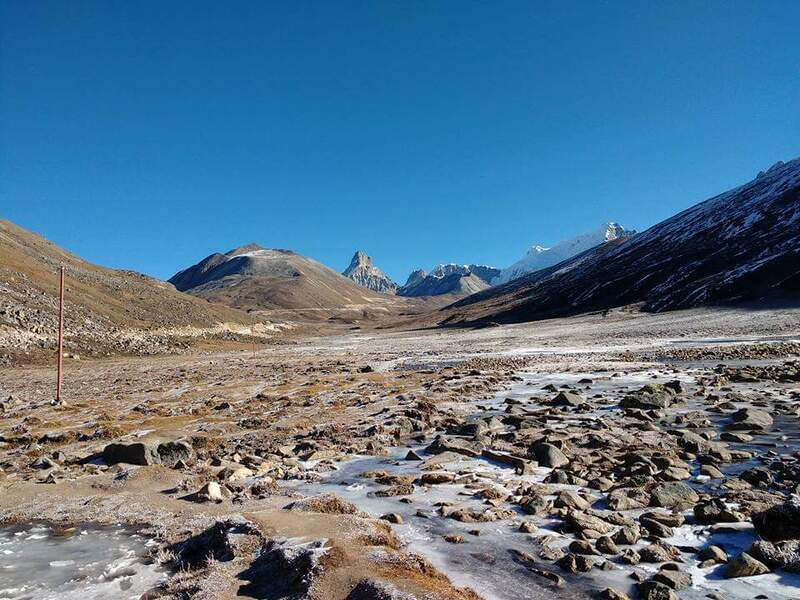 I almost lost my feet to Frost Bite and my life to hypothermia on the way to Gurudongmar Lake. I fell under the second category in the table I've drawn above. The bike tires couldn’t get a grip on the road due to ice, black ice and mud. So, I had to get off and push it through patches of mud, ice, puddles of water and crushed snow as well as many water streams. The freezing cold water (along with the Ice/Snow!) gradually seeped into my shoes. Riding in such adventurous terrain had given me an adrenaline rush so, in the heat of the moment, ironically so, I just ignored the water in my shoes and kept riding without considering the after effects. Yeah it IS a screenshot from my mobile phone! Stop judging me! LOL! The road conditions consistently worsened as I proceeded towards the lake and I finally decided to return back to the hotel. My feet were completely frozen and the hotel was 45-50 km away. My misery doubled when a barbed wire got entangled in my rear tire and the chain bringing my bike to a complete stand-still. 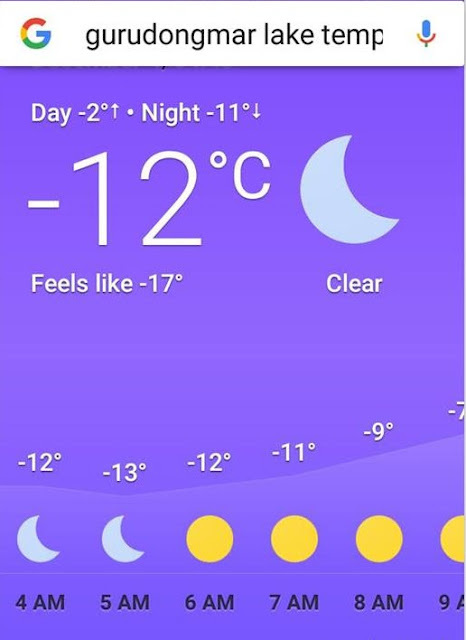 The temperature was -5°C, the sun was shining brightly as though it were noon, and I was stranded in the middle of nowhere with my feet frozen with my bike broken down. Inspite all this, I managed to drag my bike till the entrance of an army camp nearby. I stood in front of their gate, panting and shivering, unable to stand on my own two feet. I was hesitant to go in or call out for help, so crouched down by my bike and began cutting off pieces of the wire. That's when the officers at the camp, Madras Sappers (Madras Regt.) notice me and became my saviors. One of them saw me standing near the camp entrance gate so he called his colleagues and his supervisor to explain my situation; who then happily took me in saying “Aap aaram kariye. Ham dekhte hai aapki bike. Aapko garmi ki sakht zarurat hai. Andar baithkar chai-nashta lijiye. Chinta na kare, sab theek ho jayega.” (You rest while we fix your bike. You are in dire need of heat. Have some breakfast inside. And don't worry, everything will be fine). After an hour or so of keeping my feet near the fireplace, my feet were still frightfully cold. To ease the pain caused by the drop in body temperature as well as the overexposure to ice, and speed up my recovery, they bought a bucket full of boiling water and told me to dip my feet in it. I felt quick relief, in just 15-20 minutes and regained complete sensation in my feet. I am & will be indebted to all those officers for the rest of my life. Unfortunately, due to National Security reasons, I couldn’t (rather I preferred not to) take a picture with them nor can I mention the names of these silent brave hearts serving our nation at the border selflessly, regardless of their living conditions or those of their families. 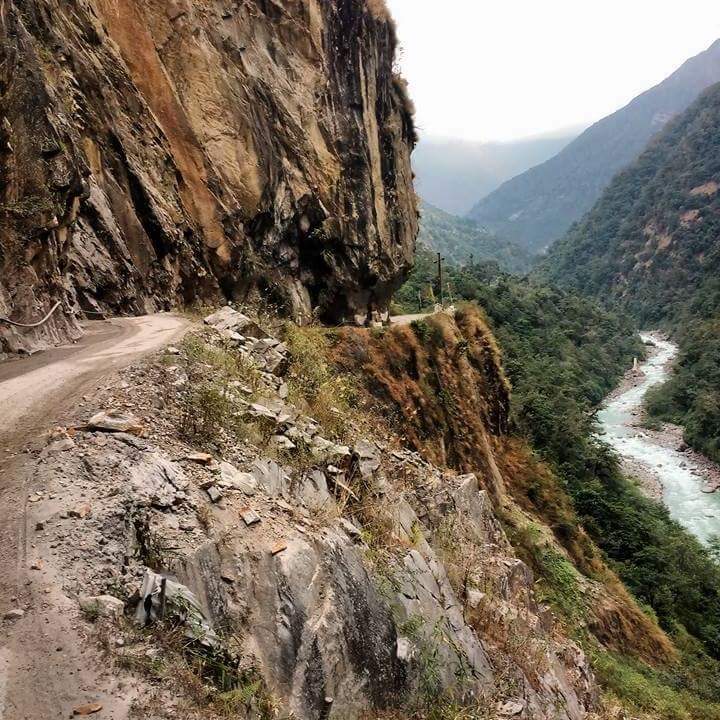 To all the riders, experienced and newbies who plan on riding in adventurous, enthralling and challenging terrains like Spiti Valley, Pangi Valley, Ladakh, North Sikkim, Arunachal Pradesh to name a few, I can only give you one tiny piece of well-meaning advice (or a suggestion for those who think highly of themselves, LOL): “Do Not Take The Challenge Lightly, no matter what!” Do not take anything for granted, especially while riding through the Himalayas (the Karakoram and Himalaya Range). These gigantic mountains are notorious and can trick a bike rider into thinking that he is in control of the situation, when in fact, they are sitting there with a wide evil grin, just waiting for him to fumble or go astray. How have your exploits from adventure trips across the globe been? Very informative and detailed write up.